The arrival of Momofuku CCDC and its accompanying bakery, Milk Bar, has been the most hotly anticipated restaurant opening in D.C. this year. Once it became known that famed New York restauranteur David Chang was moving into downtown's boutique-laced CityCenterDC development, the watch began for when he would open. Although late summer was rumored, Milk Bar finally flung its doors open first on Friday, October 23, followed the next day by Momofuku CCDC. How did Washingtonians react? 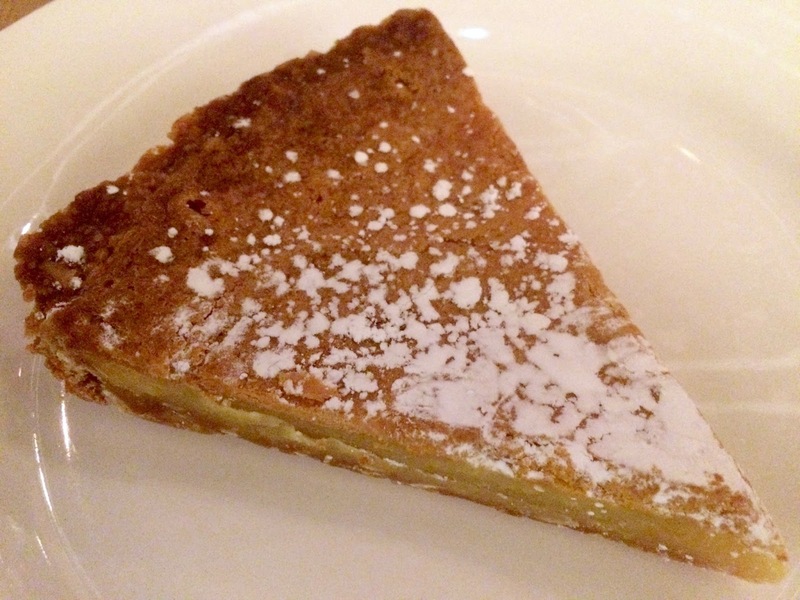 Chaos is one word to describe the mad-rush to be among the first to sample Milk Bar's crack pie and slurp Momofuku's ramen. Hours-long down-the-block lines formed for Milk Bar. 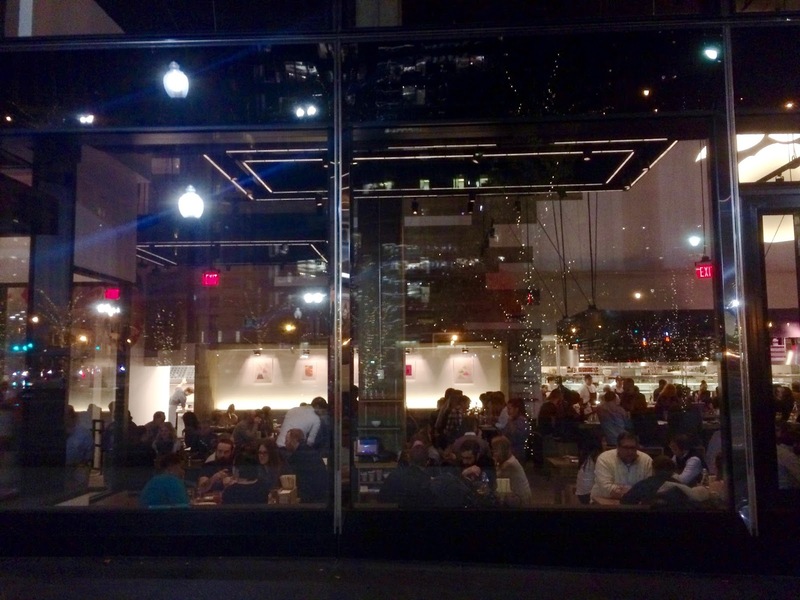 Available reservations for Momofuku CCDC quickly disappeared (as I'm writing this on the morning of November 8, I see there are three either very early or very late times available on Open Table for Monday, December 7. That's it). What's behind this madness? Like the most successful restauranteurs, Chang, a Northern Virginia native, hasn't just built a chain but a brand, one with a dedicated following of food-minded individuals. 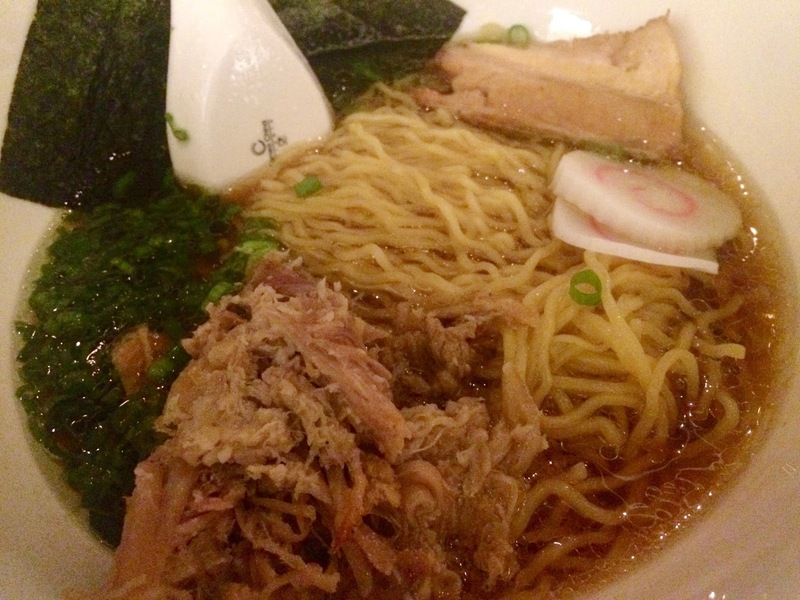 It all started in 2004 with the first Momofuku restaurant, the Noodle Bar in New York. Today the Momofuku empire encompasses 11 restaurants in 4 cities, 7 Milk Bar bakeries, 2 cocktail bars, a magazine and several cookbooks. 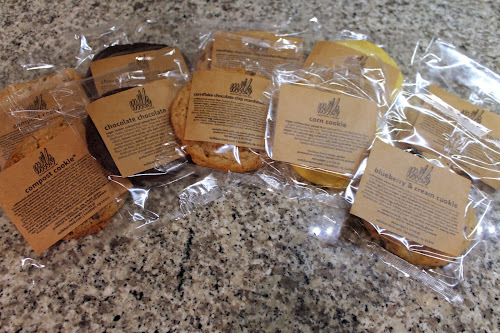 Chang and Milk Bar pastry chef Christina Tosi have both won multiple James Beard Awards and have appeared as judges on cooking shows like Top Chef and MasterChef. They are clearly among the American foodie elite. Momofuku and its offshoots employ a similar strategy that I believe is what makes them so popular: a winning and refreshing formula of clashing high-and-low brow styles. Inspiration for Momofuku cooking runs the gamut from street-food to high-end tasting menus. Similarly, Milk Bar features original confections made from exacting recipes but featuring kitschy ingredients like highly processed children's cereals. This makes Momofuku cuisine immediately familiar but also exciting and different. I'm no stranger to the brand. I first got into Momofuku through its magazine, Lucky Peach, which I started reading soon after it began publishing. It was there I came across the recipe for Corn Cookies, which I absolutely fell in love with. I got the Milk Bar Cookbook and made Crack Pie and Compost Cookies, plus I adapted Tosi's cereal milk concept to create an ice cream pie and a baked Alaska. 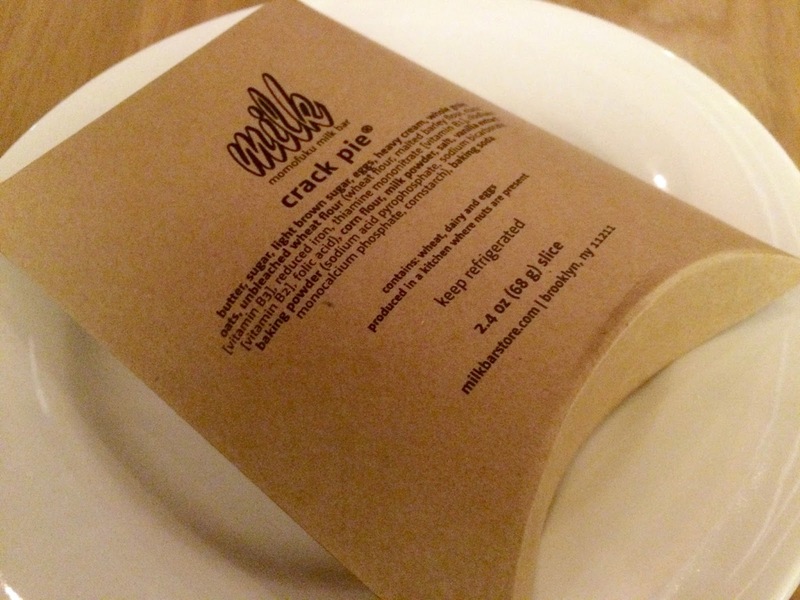 Chris and I had a wonderful dinner at Momofuku's Ma Peche a few years ago, and have been known to stop in for cookies at New York Milk Bars. 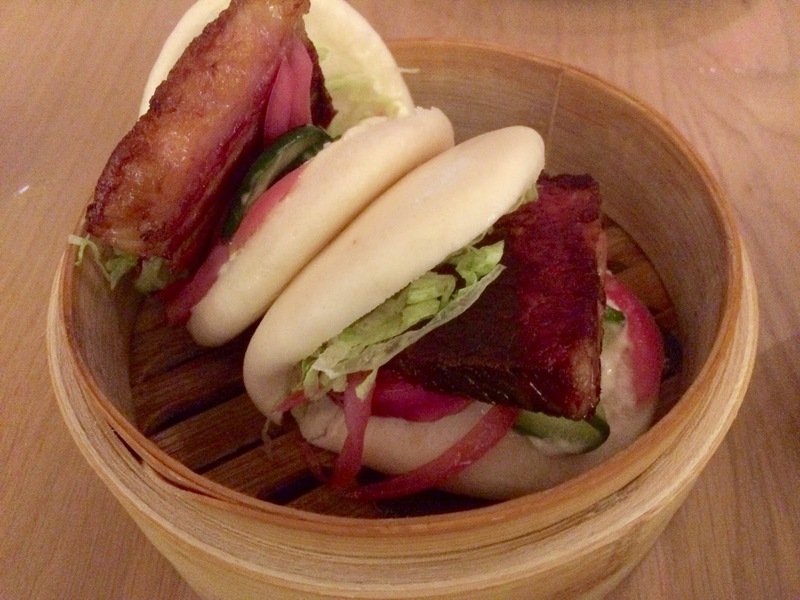 So my expectations for Momofuku's DC debut aren't formed from just the hype but my own experience. Walking into Momofuku CCDC at 7 p.m. on Saturday, I was instantly grateful that I had pounced on the opportunity to make reservations, as I overheard the host tell walk-ins that the wait was 2 1/2 hours. Incredible. Even more incredible, the "okay" responses, as said parties gave their names and settled in for the long wait while we were seated after just a few minutes passed to clear our table. Sorry guys, I just don't do long waits for restaurants. Although Chang told Washingtonian's Todd Kliman that CCDC is not a Noodle Bar, the restaurant's menu does most closely resemble Noodle Bar's, with its prominent selection of noodles and buns. Other menu items appear sourced from other Momofuku restaurants as well: there's the "country hams" you can find on the Ssam Bar menu, and the Kimchi Apple Salad, "Wedgeless" Wedge Salad and Pork Bun look borrowed from the current Ma Peche menu. But who really cares if parts of the menu are duplicated, since it's not like we can go elsewhere in D.C. for these dishes. The menu is divided into snacks, buns, salads, noodles & rice, meat & fish, vegetables and "etc.," a category that includes meat and fish dishes but that read more like appetizers such as Shrimp Louie served with lettuce wraps, Russian dressing and jalapeño. Of course, we began the evening with a round of drinks. The bar serves all of the cocktails in rocks glasses, even "up" drinks normally served in a cocktail glass. This meant that my Juniper #3, a bitter-sweet and sour concoction of barrel-aged gin, apricot, Campari and lemon, looked kinda puny taking up the bottom fourth of a tumbler, but it was a decent drink. I was more impressed with CCDC's take on the classic Vieux Carré, which, served on the rocks as they do, actually takes up the full glass. They mix their rye and bitters with armagnac brandy instead of the traditional cognac, for a drink that's sweet and sophisticated. 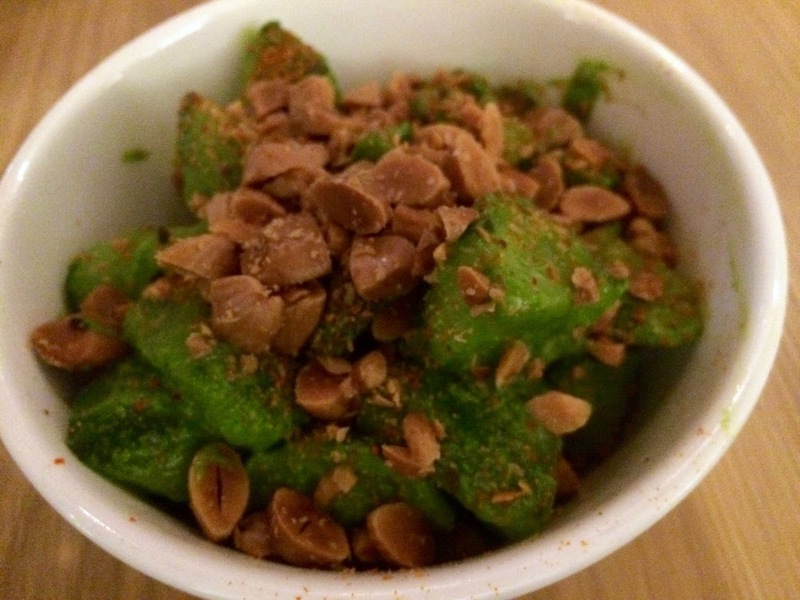 On the advice of a coworker who'd already eaten at CCDC, we started with one of the snacks, the Spicy Cucumber, which effectively blends the cooling powers of cold cucumber chunks with a spicy sesame-scallion sauce and arrives topped with chopped toasted almonds. Our other starter was the brisket buns. Each bun order comes with two tortillas-like buns wrapped around a filling, in this case flavorful tender brisket with (mild) horseradish sauce, cucumber and pickled onion. These items have other more interesting ingredients than just what's printed on the menu, which the runners bringing them will tell you about. However, they rattle them off so fast--and the restaurant is so loud--that it's unlikely you'll actually catch what they'll telling you. For our mains, we split two of the noodle dishes. Both came in large bowls and I appreciated that they provided small bowls so we could share both of them. Given Momofuku's origins as noodle restaurant, you would hope they would excel here, and they didn't disappoint. The namesake dish--the Momofuku Ramen--was very good. 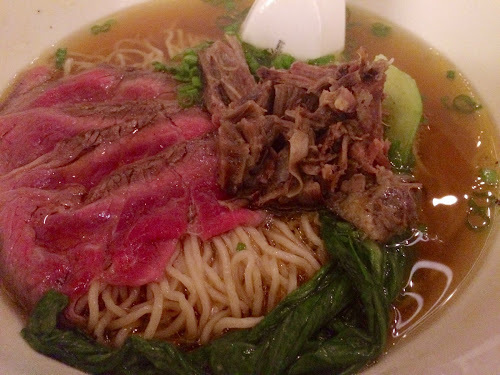 The noodles had a chewy texture that rivals (but does not surpass) the ramen at Daikaya. It features two kinds of pork--pork belly and pork shoulder, both of which were flavorful and in sufficient quantity. In a nice change of pace, the ramen broth was not too salty, something that sometimes bothers me at Daikaya. Our other bowl was the Beef Noodle Soup, which was also delicious. The noodles were a little thinner than the ramen but were just as chewy. The broth was intensely beefy and like the pork in their ramen, the brisket came prepared two ways: sliced and shredded. As big as these bowls were, we polished them both off. When it comes to dessert, it's important to manage some expectations. CCDC doesn't have a proper dessert menu. Rather, they allow you to order anything from the attached Milk Bar bakery. Depending on what you're expecting, this could be a plus or minus. On the plus side, this is a fantastic way to experience Milk Bar without having to stand in the bakery's ridiculously long (and from what I hear slow) line. That line wouldn't be forming if the items weren't tasty. I'm a particularly big fan of the cookies. We ordered two of each to to go and couldn't resist biting into the Bluberry and Cream Cookie as soon we got home. It is an exquisitely good combination of dried cranberries and "milk crumbs," which are made from white chocolate, milk powder, butter and sugar. On the minus side, instead of a properly plated dessert with warm and cold elements, sauces and other toppings like you'd usually get at a restaurant, you're getting a dessert from the fridge with a plastic or paper wrapper. The pie, I think, in particular suffers from this presentation. I've made Crack Pie and it's really good. Served like this it's still tasty, but rather cold and hard. It might be worth Tosi's time to consider upscaling the presentation of some of the bakery's delicious items for presentation in the dining room. I liked the minimalist, materials-oriented design of the restaurant, which reminded me a bit of the look of José André's Beefsteak. The boxy geometric interior is largely devoid of color, constructed of beige wood, gray concrete, and black metal, plus huge plate glass windows. The service was also good. As busy as they were, I was afraid there could be problems, but the only real snafu was when our noodle arrived without any utensils for eating them. Otherwise, service was prompt and attentive, with water and cocktail refills arriving just-in-time. Would I stand in line for 2 1/2 hours for this? No, I wouldn't, but as I said earlier, I'm just not into that. This also wasn't the best Momofuku meal we've ever had--that honor still goes to our wonderfully memorable dinner at Ma Peche. That said, my high expectations were pretty much met by our first visit. All of the food was really good and I would certainly consider going back. This is the second outpost in the CityCenterDC development to open from a major New York-based chef (the other being Daniel Boulud's DBGB). Further proof that D.C.'s restaurant scene has really moved into the big leagues recently. Momofuku CCDC, 1090 I St. NW (at 11th Street), Washington, D.C. (in the CityCenterDC development). (202) 602-1832. Reservations: Open Table.